Our most popular styles, colors and sizes are ready to ship immediately. That means you can receive your dresses in just a few days, not weeks. Doesn't fit the way you'd like? No problem. 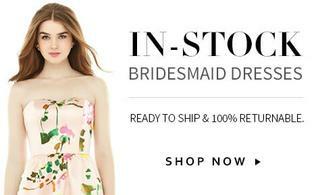 All of our In-Stock dresses are 100% returnable. In-Stock dresses are available online; exclusively in the U.S.
Browse our collection of In-Stock Dresses and find your favorites. Try on your dress in the comfort of your own home & if you love it, keep it. If you're not 100% satisfied, return the dress within 30 days, no questions asked. Mix & Match styles to flatter all your bridesmaids. Fitted women's tuxedo jacket cut to flatter.